Kansas GOP Insider (wannabe): Budget Shortfall -- Who Gets the Blame, Part 1. So here's where we are: Basically up a creek with no paddles. There's a storm brewing, and the SS Kansas has a whole lot of people, with limited budget experience, who want to pilot the boat. Yesterday, we learned that Kansas tax revenues fell more than $50 million short of projections. The budget legislators passed last month? It's busted -- completely. Normally, this situation gives Brownback ultimate authority to make cuts as he sees fit. This has happened in the past, and Brownback has already announced that higher education -- KU, K-State, Wichita State, Emporia, Fort Hays- will see a 3 percent cut that amounts to about $17 million. It's not going to be enough, and somewhere the state budget office workers' calculators are shooting flames from so much action. Last year when the budget officially busted, the legislature was no longer in session. This year, not only is the legislature still in session, but Brownback has yet to sign the budget legislators adopted. If he detests the Legislators as much as I suspect he does, he'll just veto their budget and force legislators to make the spending cuts and potentially raise the revenues necessary to fill the hole. Will Brownback fall on his sword and make the cuts himself? Right now, almost every Republican I know is putting distance between themselves and Brownback. I can't say I blame them. However, legislators do not get a pass for the hole in which Kansas finds itself. And hey, Dems and "Mods" (same thing), you don't get a pass either. There's enough blame for everyone to share. Let's recall, shall we, how your revered (absolute train wreck) leader, former Gov. 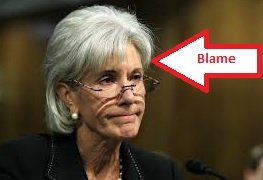 Kathleen Sebelius DELAYED state tax refunds and state paychecks in 2009. She was a real peach that lady. Even now, I'm still stunned at the virtual media pass she received when her plan to make ends meet involved holding onto money that the state owed to individuals. That's downright immoral. Cutting planned expenses to higher education? That's the moral equivalent of canceling your cable before your contract runs out. So, libs and media, before you go on your merry way crucifying Brownback, of whom I'm NOT the biggest fan, please take the entire logging industry out of your eye. So Sebelius and the last administration backed by a legislature with a majority lead by Dems and their RINO friends, get a heaping share of this blame. Brownback and his conservative allies have been attempting to clean up some of her mess. Sure, they're not doing the greatest job ever, but they're trying, which is a heck of a lot more than I can say for moderates and liberals. Their sole rallying cry is "Give Schools More Money!! Whether we can afford it or not!"